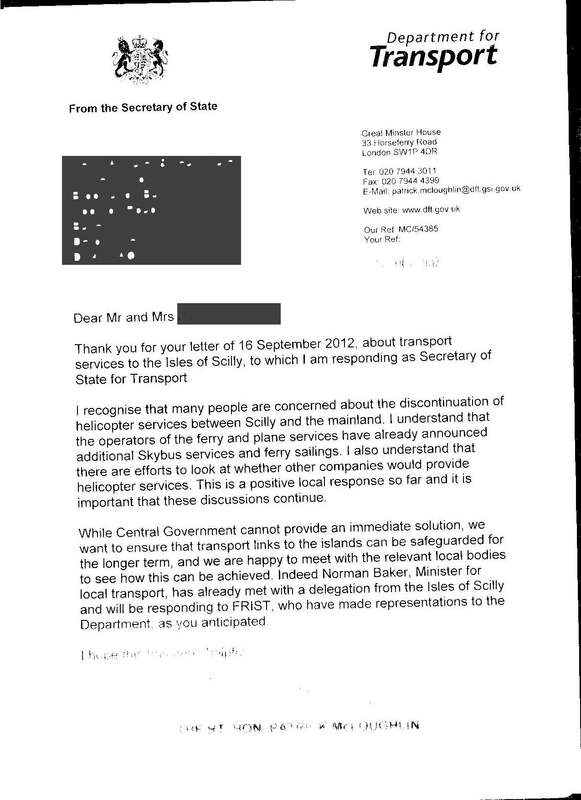 FRIST wrote to the Norman Baker (Under Secretary of State for Transport) on 5 Sep 2012 raising concerns about the predicament of the islanders and has not yet received a response. In the meantime a supporter of FRIST (not resident on the islands) has written to the Minister and received the following courteous reply (see link below) from the Secretary of State for Transport. It seems that FRIST will receive a reply to its letter shortly. Thank you Mr & Mrs S for your support. Comment: The Minister’s delay may be tied to the imminent decision about whether the DfT is prepared to accept proposals for the funding of much needed works on both St Mary’s and Penzance Harbours. A response is required by the DfT from Penzance Town Council about proposed works on its Harbour before a decision is made. Penzance Town Council has arranged a special Town Council meeting on Wednesday 10 October to discus the matter.